4.94 out of 5 based on 27 user ratings. We rented a bus for our wedding back in June, and they were great. Service was good, they were punctual, and the bus was clean and nice. I should note that the place we got married (the Bourne Mansion) had a very narrow driveway, and the driver did a great job maneuvering the large bus on the property. I would recommend them to anyone. A BIG thank you to Elegant Limousine for the service they provided on my wedding day! From the first time I spoke with them to the execution of our service on the day of our wedding, they were flawless! The representative with whom I spoke helped determine what vehicles we need, provided fantastic pricing and provided very clear and concise contracts. They also assisted in making up the “schedule” for the day of to make sure enough time was allotted. The drivers for both the limo and shuttle service we booked were exceptional…arriving early in fact! Both the limo and shuttle made multiple runs and never once was late. The vehicles were clean and modern and I would not hesitate to use them again! Will be booking again soon for honeymoon transportation! Very professional, prompt and nice driver. Had isle runner for us at church. We used Elegant Limo for our coach bus for our hotel guests. Everything ran smoothly, the bus was clean and the driver friendly. The rates were very reasonable as well. 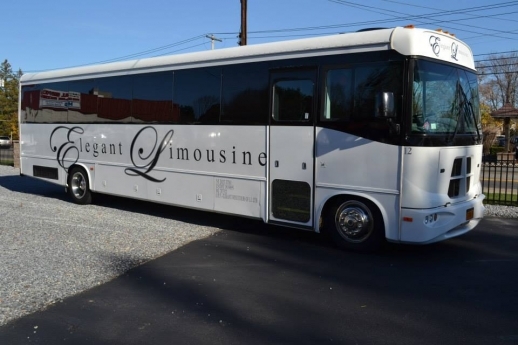 We used Elegant Limo to book two 56-passenger shuttle buses to transport wedding guests between our hotel (Hilton Garden Inn, Ronkonkoma) and our reception venue (Bellport Country Club). The service was excellent and we are fully satisfied with choosing this company. The drivers were so friendly and reported to the hotel and venue in a timely fashion on all their trips, drove carefully and helped us execute the transportation plans for our wedding guests as seamlessly as we could have imagined. They were easy to book, reached out to us a few weeks before to confirm our agenda and the person who would pay the drivers, and they took care of the rest. We provided them with a detailed agenda with projected pickup and arrival times and they made it all happen. 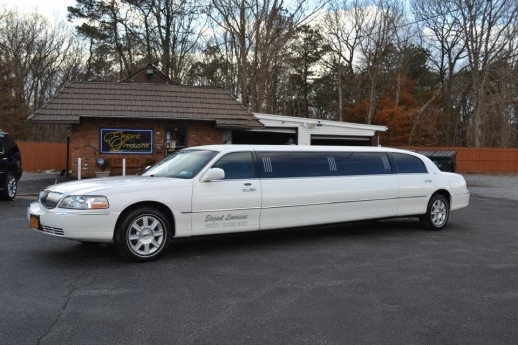 Elegant Limo is a very classy company and as reliable as they come. Congratulations on your upcoming wedding! From the time you speak with our bridal consultant to the arrival of your special day, our staff at Elegant Limousine provides personalized attention to the bride and groom. Our well trained chauffeurs, dressed in black tie tuxedos, will offer full coordination with your photographer. We offer complimentary champagne, full beverage bar, bridal horns, and a church aisle runner if need be. We also offer discounted packages for Bachelor/ette Parties. Be sure to inquire about our special pricing for winter weddings, Friday and Sunday weddings. We also offer a complimentary pick up after your reception or a ride to a local, New York airport, for your Honeymoon. We are a full service limousine company that offers a variety of transportation options for weddings, proms, nights out on the town and also airport transportation. What types of services do you offer? We are a full service limousine company that offers a variety of transportation options for weddings, proms, nights out on the town and also airport transportation. We also offer motorcoach transportation. Many Brides and Grooms utilize coach buses to shuttle large number of guests to and from the venue and the hotels the guests are staying at. What are some of the specialty cars you have on your lot? We have 2 antiques cars which are great for memorable pictures. We have a 1964 Bentley and a 1940 Cadillac Fleetwood. Both vehicles have been completely restored. How many limos are standard to a typical wedding? 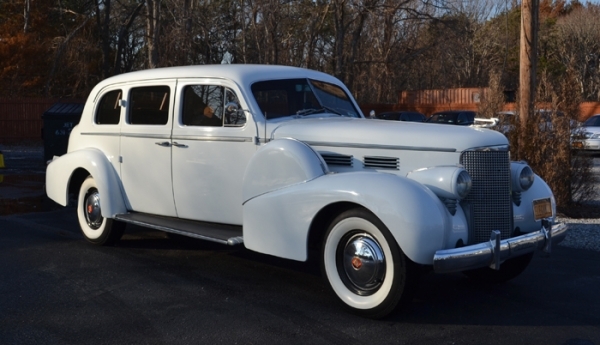 Typically a wedding entails 1-2 vehicles depending on the bride and grooms preferences. Some prefer to have the bridal party all together where an SUV limousine is used. Larger bridal parties demand two limousines of any kind. An Antique vehicle is great for making a grand entrance when arriving at the church as well as great photographs to remember forever. 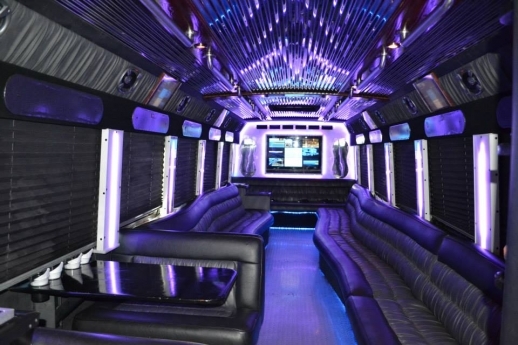 For large weddings brides and grooms tend to also use party buses. This keeps everyone together to enjoy the time with just your bridal party before your reception. What amenities come with each limo? Each of our limousines comes stocked with a full beverage bar, complimentary champagne, church aisle runner, and bridal horns. All of our chauffeurs are dressed in full tuxedo attire. What should couples expect from you? Here at Elegant Limousine, our standards are above most. We strive at being the best. Our staff is courteous, professional and available 7 days a week. Laurie, our wedding consultant, assists brides in vehicle choices, coordinating times, and suggestions with picture locations. How much in advance do couples need to book their limos? Reserving your limousines in advance is always a good idea to ensure availability of the limousine that you prefer. Our large SUV's generally book up first. Party Buses and SUV's generally book up first. There is a great demand for these. For all Packages booked through LIWeddings.com, bride and groom receive free drop off to local airport for their honeymoon.